Our fruit reflects our passion for excellence, and we’ll go to any measure to achieve it. While our fruit displays balanced color and size, every piece must deliver unmatched flavor. Without it, even picture-perfect fruit won’t capture repeat customers. Rich appearance doesn’t mean much if the first bite doesn’t explode with memorable taste. That’s why every step we take intentionally drives a complex flavor balance into all grades of fruit we ship. Our focused farming practices expose developing fruit to optimal growing conditions, even when it means risking profits over quality. Management of sun, water, nutrients and crop protection offer an environment that allows beauty to encompass uncompromising flavor. When consumers reach for the Gee Whiz label, they quickly learn that our fruit and cider stands high above other choices. Flavorful, nutrient-rich, and perfectly textured, our products become a staple amongst health-conscious shoppers. 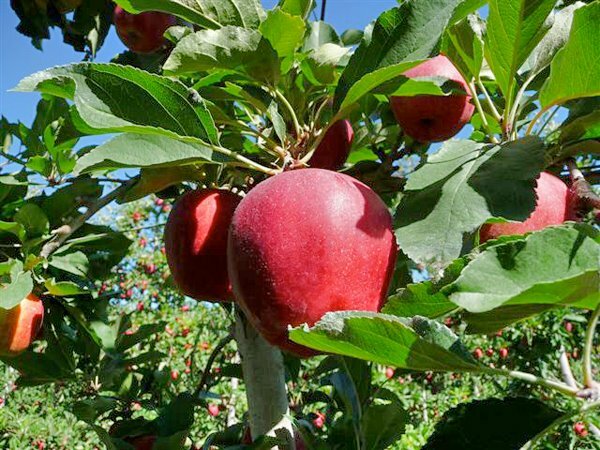 Auvil Fruit Company owns and farms orchards at two primary locations in central Washington state: Orondo and Vantage. Nestled along the Columbia River, few locations in the world offer the pristine elements found in these ideal growing environments. All of our orchards are SQF certified, ensuring that our fruit is handled with the highest standards. Of course, that’s just part of the Gee Whiz vision. Miles of shade cloth, minimal use of chemical sprays, and judicious water usage are just small parts of our commitment to excellence. Auvil’s position at the forefront of the fruit industry rests on Grady Auvil’s original vision. But since 1994, steady operational improvements and dramatic growth has come through the leadership of The President of Orchard Management, Del Feigal. Del’s twenty-two years focused on growing excellent fruit with Auvil reaches back to his own childhood, where he grew up on a small orchard. After college and subsequent forays in orchard management and chemical sales, Del brought his passion to Auvil. His drive to develop bigger and better growing techniques quickly caught the attention of the fruit industry. Sign Up to Receive Delicious Recipes, Exclusive Videos, Updates about Our World Class Fruit, Farming Stories and More.